Ice Climbing – What’s it All About? If you are someone that loves the thrill and danger that you get from rock climbing, or are simply looking for a new activity to get the adrenalin pumping, you may want to think about ice climbing. That’s right, climbing a sheer wall of what was once free flowing water and will turn back to its liquid state sometime in the future. While scaling the peaks of Ben Nevis or Mount Snowdon can be done every year, tackling a frozen waterfall is often a once in a lifetime opportunity – it is also one of the most dangerous and thrilling things you will ever do. “Sound good, but who can do it?” I hear you ask. Well you my dear reader, you can do it! 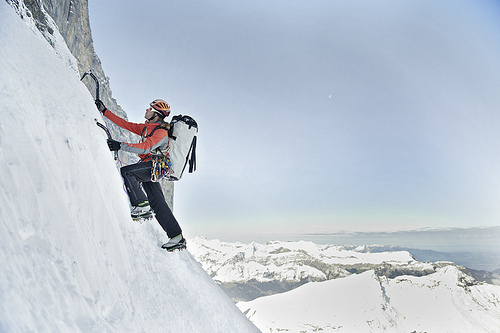 In fact almost anyone can take up ice climbing as long as they are reasonably strong and have decent fitness levels. From a fitness perspective, ice climbing is up there with any regular form of exercise and you can rest assured that you will be exhausted having scaled a wall of ice, not only physically but mentally. It is important to remember, that climbing will involve your body weight being supported for extensive periods with just the points of your axe and spikes on the bottom of your boots. This is physically demanding, and can be downright scary! 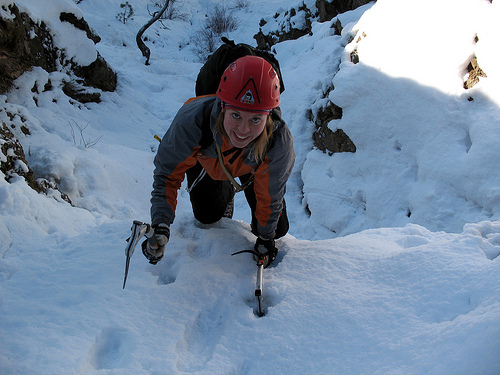 Ice climbing and similar activities are all about the thrills and adrenalin highs you can experience. If sweaty palms and a racing heartbeat isn’t your thing then you may want to consider rambling! The thrill of the ride begins as soon as you find that perfect axe placement in the ice and then continues until you reach the pinnacle of your climb, and you can guarantee it will not all be smooth going! At some point or other you will run in to trouble with nowhere to dig in the axe or get a foothold – this is when the thrills move to a whole new level – one that may involve clean underwear! As well as the thrill of climbing, there is also the buzz of actually completing the challenge. You see, ice climbing is not all about physical strength and fitness; it is also about technique and tactics. From the bottom you can map out a climbing route and put it into practice, the sense of achievement when successfully completing a climb is hard to beat. As you can well imagine, ice climbing is not a summery shorts and t-shirt affair, and despite it getting pretty hot under the collar at times, you will need to wrap up warm. Ski wear is probably the ideal type of clothing for this activity as it is designed to cope with freezing temperatures. If you are doing a course in ice climbing (recommended), then all of the safety and climbing equipment (ropes, helmet, axes, crampons, etc.) will be provided. Obviously, if you are experienced enough to go it alone you will need your own equipment. 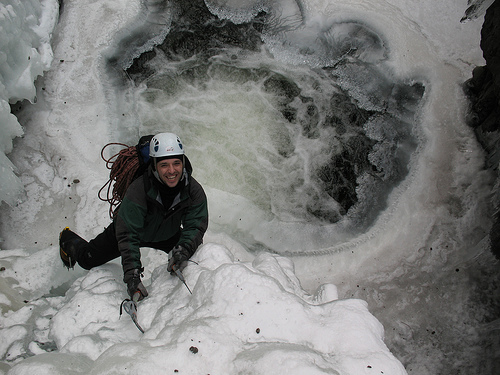 Ice climbing is a truly exhilarating experience, just remember one thing… don’t look down! Gray Montel is a writer and researcher for Sealskinz. He writes mainly about Cycling, Outdoor, Ski, Running, Sailing, Watersports and Team Sports. This entry was posted in Ice Climbing, Winter Sports and tagged Ice Climbing. Bookmark the permalink.